The final nail in Hide's coffin is now almost complete. The National Party who are concerned about Rodney bringing in any extra MP's with him after the Sensible Sentencing David Garrett hypocrisy must now consider the reality that he won't get elected in Epsom after he signed off on this ridiculous situation where two unelected Maori will be added to all 19 standing committees, in many cases changing the balance of power in those standing committees. Let's be clear, I want Maori representation, I think it was appalling that Rodney Hide threatened to resign from the Government if Maori were given any representation in the new Super City structure, but that representation must be earned within Maoridom by them voting and electing who they want to be represented by, under this fiasco these positions are appointed, no democratic mandate whatsoever! How ridiculous is it Hide threatened to collapse the Government if Maori had the right to vote in representatives, only to sign off on a deal where all 19 standing committees will have two Maori with voting powers simply appointed with no mandate??? This isn't a right wing or left wing thing, it's just basic democratic convention. Should Maori have representation? OF COURSE! Should that representation be appointed with no democratic mandate? OF COURSE NOT! 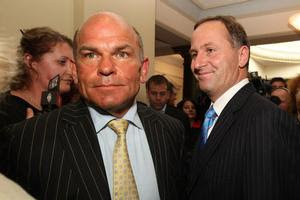 David Farrar explained to me in Wellington during the Backbenchers filming that the strategy for Epsom was to tell voters that if they didn't elect Rodney, Hone would hold the balance of power, their belief is that Epsom voters will hate Maori more than they hate sexist hypercritical bullies. IF that is true, how the bloody hell will those redneck Epsom voters respond to this fiasco? ACT need Hone in the Maori Party so that he's the bogeyman, National realizing Rodney won't pull any extra MP's in with him now need to rely on the Maori Party and so have put immense pressure on them to dump Hone. It's like a Mexican Maori standoff, where instead of guns pointed at each other, they all have the guns pointed at their own heads. If Epsom is as bigoted as David Farrar hopes, they will see this appointment of Maori across the board without any actual democratic mandate from Maori as a crime. Rodney is dog tucker and ACT are gone. The pressure by National on the Maori Party to remove Hone will now be immense as National realize they will be reliant on the Maori Party for the Government past the election, and the question starts to become what Hone will do post Maori Party if they do make him walk the plank? A New Left Wing Party quietly peculates. National isn't too worried about democracy. Their credentials on that are very clear: A referendum to dump MMP; the coup dumping an elected Environment Canterbury board and replacing them with farmers who lead the fight for more irrigation; The First Past the Post election of the Auckland Council that saw - Auckland-wide - 62.5% of all votes cast electing not one person to the new Auckland Council. National's record on democracy is appalling....and long standing. Yes, they offered the original two-step MMP referendum series....but be very clear that reform and a change to MMP was NOT supposed to be the outcome. Now, if they can appoint some right-wing Maori political clients to some of those committees, they can tip the balance their way....given the votes that DID somehow manage to elect anyone in the real election didn't go their way.